Wai-O-Tapu ("Sacred Waters" in Maori) is an active geothermal area 27 kilometres south of Rotorua. $32.50 will get you through the door and 90 minutes will give you time to see the whole thing, with the exception of Lady Knox Geyser. 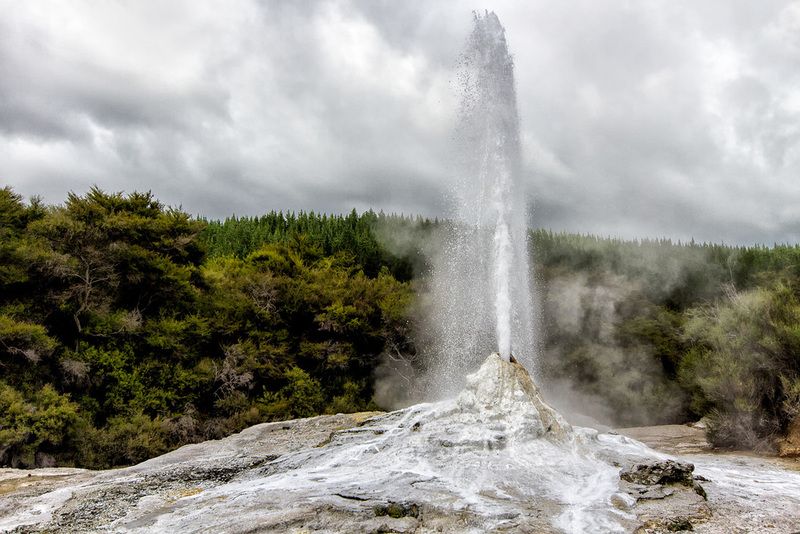 To see the Geyser "erupt" you'll need to be there around 10am as it erupts at 10:15 on the dot. Why is it so predictable? Well, it erupts with a little human intervention, I'd probably violently erupt if someone poured surfactants down my throat too, but it does give the opportunity to learn a lot about geysers. The rest of the park, according to the guide, is a 75 minute amble, considerably more if you stop at every feature along the way to take its photo. It's home to one of the most well photographed geothermal things in the country, the Champagne Pool, which I present to you above, taken from the exact same angle as 26000 other photographers. Getting down low to take the picture threw up a few issues, notably steaming the lens in a nano second and secondly trying to avoid tumbling into the 75°C water which I imagine would provide you with a rather uncomfortable scalding deep clean. Other than that the park provides its visitors with an assortment of bubbling mud, steaming chasms and brightly coloured pools which closely resemble a child's crayon collection that has been left in the sun too long, just take a look at the Devils Cave Pool as evidence. Taking shots of the very steamy champagne pool threw up some technical difficulties. The Auckland City Skyline at dusk.